The goal of this page is to provide support for teachers who are moving to Québec to teach in Cree language communities. For more information, please consult the Cree School Board website. Comparative Structures of East Cree and English. By Marie-Odile Junker, Marguerite MacKenzie & Julie Brittain. 2012. This free, downloadable booklet was created for English speaking teachers. It describes the main characteristics and structural differences existing between East Cree and English. As well, this booklet contains advice on how to teach English and East Cree bilingually. A similar booklet is available for French. Adapting the Bilingual Aphasia Test for East Cree speakers: Recommendations for the Cree Health Board. By Roxana-Maria Barbu, Marie-Odile Junker & Mimie Neacappo Carleton University. 2016. These recommendations were made at the request of Speech Therapists working in James Bay, who were struggling with misdiagnosis of Cree children’s language acquisition. It might be useful for teachers as it outlines some differences between English/French and Cree that are often overlooked, when assessment material coming from English is used without discrimination. The following downloads are free and will provide you with all you need to be able to see and write with syllabics on your computer. Download the STANDARD package for PC computers, Windows 98 and up. Download the STANDARD package for Macintosh computers, MAC OS X and up. To learn how to map the syllabic onto your keyboard, please consult the syllabic chart, as well as the one with audio examples (available as a .zip file here). For a guide on how to install these fonts, please consult our videos. 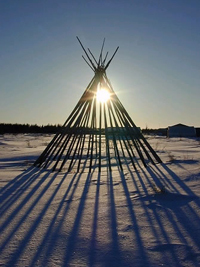 First, take a look at the Cree conversational CD and free, downloadable manual. The audio files from the CD are also available for download, free of charge on the Cree-Innu Linguistic Atlas website. There, you’ll be able to listen and compare the many varieties of spoken Cree in the various communities throughout Canada. The atlas also contains several activities designed for the classroom. Other references are available in the booklet “Comparative Structures of East Cree and English” (see above).